The 1975 Hess truck is a newly designed cab and box trailer. Included are the 3 (4 ring) oil barrels. The 1975 barrels did not have Hess labels on them this year and are in sealed plastic. The truck has sliding doors on each side of the trailer and rear doors that open and close. It is a one-piece style cab and is the first non-split window truck in the Hess line. The 1975 truck is made of a lighter color green than the 1976 edition. The box is in excellent condition with bright graphics (see pic). Complete with the top & bottom inserts as well as the battery card. There is nothing written on the other end of the box. Decals are all in excellent condition (see pics). 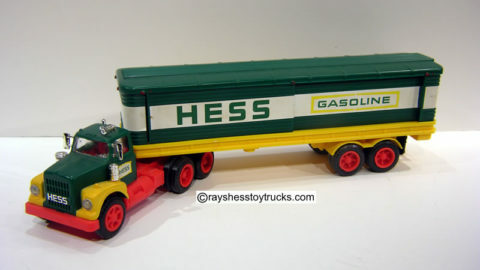 1975 Hess Barrel Truck – Loose Truck Sale!